This boat season in St Paul, MN has been one for the ages! The weather has been wonderful and the lakes around this area have been the perfect spot to rest, relax and get away from the stressors of everyday life. That is, if your boat is properly functioning. If your boat has recently gotten damaged due to a collision with a boat, dock, or debris, you may not be feeling quite as optimistic about this year’s boating season. At Anchor Marine Repair, we know the feeling that you are going through. Rather than sulking and wasting what is left of this year’s boating season, let our expert boat collision repair staff fix your boat affordably, so that you can get back out on the water in no time. There is a reason why our team has been chosen as the #1 storm and collision damage repair shop in the area. Our mission is to repair your boat to better than pre-accident condition. We do not strive for mediocrity. Instead, we aim to bring back that natural beauty of your boat. 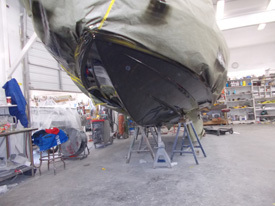 Collision repairs are our specialty as we can tackle all sorts of damage ranging from fiberglass damage to transom or propeller mount repair. We do not shy away from working with your insurance carrier and always keep your needs at the forefront when working with these third parties. The stress of a damaged boat can be overwhelming for many. When making this large investment, you never imagine getting involved in any type of collision. At Anchor Marine Repair, we want to take as much of the stress around getting your boat repaired off of your plate. That is why we offer complimentary pick up and delivery services within a 250 mile radius of the St. Paul, MN area. So, sit back and relax while our team with more than 45 years of combined boat repair experience brings your boat back to better than pre-accident condition. While we have your boat, it will be stored safely within our 10,000 square foot repair shop. We offer elite level customer service along with using high quality repair products, at a price you can afford! If you have recently been involved in a collision with your boat, our team at Anchor Marine Repair can get your boat back to working order in no time. Don’t let the rest of the boating season in St. Paul, MN slip away. Give our affordable boat repair specialists a call today at (763) 972-3540 or email service@anchormarinerepair.com to set up a free consultation!